As we celebrate Thanksgiving this week, I want to take a moment to tell you, our wonderfulNatureworks Email reader, how grateful I am foryou. So often I hear people say that they don’t know how I do it, meaning, find the time to write the email every week. 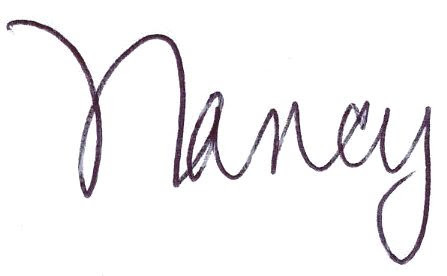 Let me share a secret with you- I LOVE to write! I wake up in the morning already thinking about what I am going to write about. Any and all time spent in my garden or those of my clients is “grist for the mill” so to speak. So the fact that you read these emails, learn something from them, are inspired by them, and share them with friends is MY gift. Beautiful arrangements including table centerpieces and cornucopias are freshly made each day. 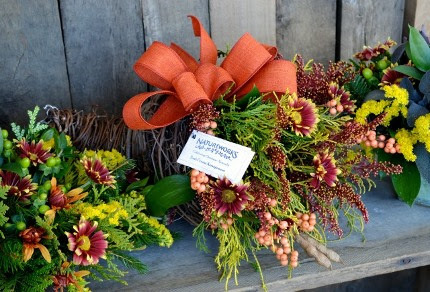 Open till 5 pm Wednesday for Thanksgiving flowers. This week kicks off the official start of the holiday season. We have been gearing up for this short, but exciting four weeks for a couple of months. The first shipment of our fresh cut, CT grown, premium trees has arrived. 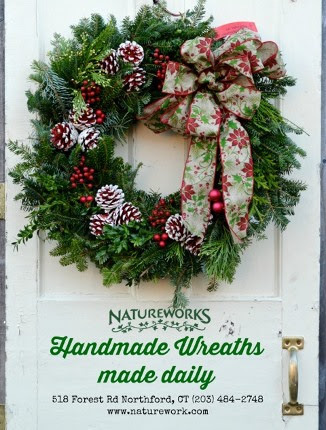 We have wreaths, greens, and all the trimmings dipped, decorated, and ready for you. Our custom order board is filling up, and our new design studio in the greenhouse is cozy and buzzing with creativity. I harvest from my yard every morning. We are CLOSED on Thanksgiving (naturally), and we open at the REGULAR time, 9 am on Fridaymorning. We call the Friday after ThanksgivingGREEN FRIDAY. I made up that term a few years ago as a protest against the Black Fridaymadness. It is OUR day to celebrate the beginning of our season of fresh GREENS. 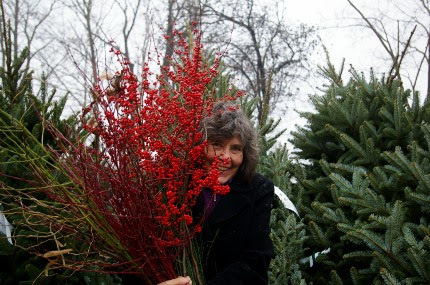 And boy, do we have lots of wonderful greens to choose from… Douglas, Concolor, and grand fir, white pine, Japanese white pine (Pinus parviflora ‘Glauca’), lacebark pine, limber pine, blue spruce, norway spruce, boxwood, golden false cypress…you get the picture! I harvest greenery, branches, and berries every morning before I head into work. 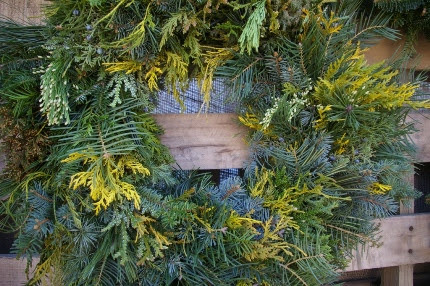 We use this wide variety of greens in all of our hand crafted wreaths and arrangements. When you shop with us onGreen Friday, you will get a $5 gift card good on any purchase of $20 or more and you will be entered into a drawing to win a $25 gift card. This Saturday is OUR holiday- SMALL BUSINESS SATURDAY. We are forever grateful to American Express for starting this movement which has grown exponentially and has raised awareness of the value and importance of small businesses that define the community in which we live. To keep things local, we offer locally made, delicious donuts and coffee all day Saturdaywhen you come in to shop. 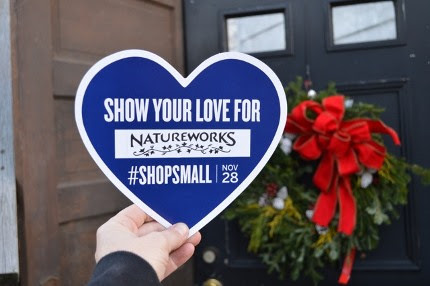 Having started this business 32 years ago with $500 and a dream, you can only imagine how it makes me feel on Small BusinessSaturday to have so many of my loyal customers come in to supportNatureworks. To thank you, make sure to download our App before you get to the shop. On Small Business Saturdayyou will get TWO check-ins instead of one with your purchase of $20 or more. 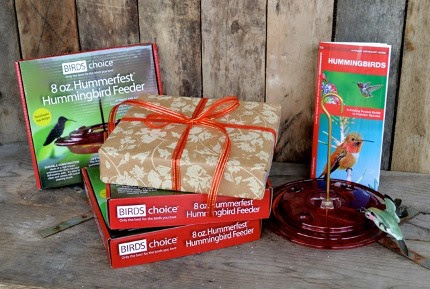 Hummingbird feeders are one of our most popular gifts all year round. hyacinths, we are also offering gift kits with crocus, miniature narcissus, and hyacinths that can be forced in decorative bowls and later planted in the garden to enjoy for years to come. These gift kits are 20% off from now through November 30th. You plant them and then chill them in the refrigerator for 8 weeks. 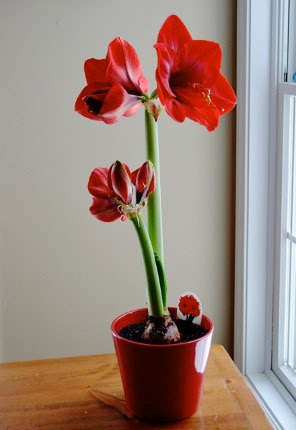 That means they will be ready to flower on your windowsill by early February, just when you need them the most! Our store is also starting to fill up with holiday plants. 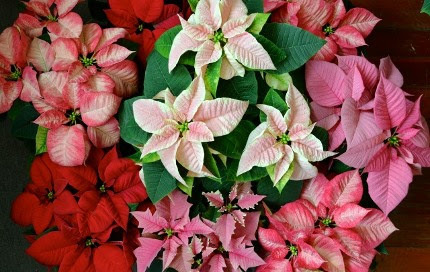 Our locally grown crop of poinsettias is just gorgeous. By purchasing plants from us, you are helping TWO local businesses! I am so excited about the holiday season- can you tell? I hope you can come visit us this week. 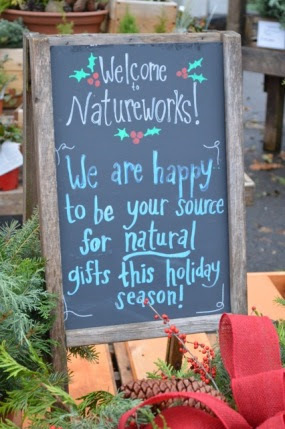 If you have family in town, bring your guests and introduce them to Natureworks. It can become a holiday tradition to visit. If you are joining with family members to visit the cemetery, remember that we offer all-natural, handmade grave pillows and pots made with beautiful, fresh greens and cones. Stock up on Wilt-Pruf to protect your evergreens, and shredded straw to finish mulching your garlic and veggie beds. Grab some paperwhite narcissus and get them started so they will be in bloom for your holiday gatherings. There is so much to see and enjoy in our little store.